Swiss Cavalry: The largely Swiss Vorhut (Vanguard) of 7,000 infantry and 2,000 cavalry, were instructed to attack from the right, while the principal thrust would come from the 8,000 infantry and 1,300 cavalry of the Gewalthut (Centre), which was dispatched on a difficult circuitous march round the left flank, over thickly wooded snow-covered slopes out of view of the waiting Burgundians. The small Nachhut (Rearguard) of 800 handgunners acted as a reserve. The reputation of the Swiss tactical system was further enhanced in campaigns against the duke of Burgundy, Charles the Bold (r. 1465–1477). Charles had operated with impunity against the French crown following his defeat of King Louis XI of France (r. 1461–1483) at Monthlhéry in 1465. After Charles’s follow-on victories at Liège (1466) and Brustem (1467), he turned his attention to the Swiss on his eastern front. Here, the growing Swiss Confederation provided the military opposition to his plans. In order to weaken the Swiss, the duke of Burgundy planned to divide and conquer, cutting a path through the alpine alliance with the most modern army he could assemble. 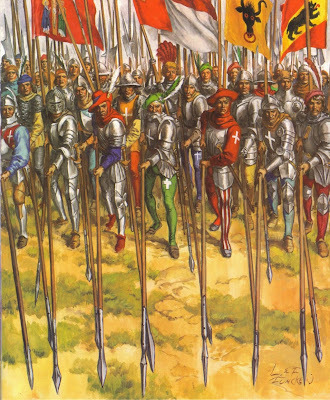 To meet this objective, Charles fielded a well-financed combined-arms army of 30,000 men, consisting of Burgundian heavy cavalry, Flemish heavy infantry pikemen, Italian light infantry crossbowmen, German arquebusiers and mounted light infantry English longbowmen. Traditionally, Burgundian armies were small, with mercenaries making up at least 30 per cent of any force. But Charles’s grand ambitions required a larger fighting force, and beginning in the early 1470s, the duke strove to create permanent troops in mixed units (companies) of heavy cavalry, heavy infantry and light infantry archers, crossbowmen and handgunners, supported by the most modern artillery available. Gunpowder technologies appeared on the battlefields of western Europe some time in the middle of the thirteenth century. Gunpowder was first utilized as a weapon by the Chinese prior to 1000 ce, where it was made into bombs and rockets. The likely conduit of diffusion from China was through Islamic lands to Byzantium or to Spain, then north of the Pyrenees to western Europe. References to gunpowder weaponry were included in armouries in Lille, Lucca, Aachen, London and Siena in the late 1330s and 1340s, and it appeared at the sieges of Tournai in 1340 and Calais in 1346–1347, and perhaps even at the battle of Crécy in 1346. The first cannon made in Europe, in the early fourteenth century, were vase-shaped tubes which fired huge darts like those shot from the old Roman ballistae. Over time the darts gave way to round stone or metal projectiles and the barrels evolved into a straight tube. But over the next 150 years gunpowder weaponry underwent a spectacular evolutionary process as guns became less frequently forged and more frequently cast, increasing both reliability and durability. These improvements also allowed gunsmiths to make their weapons both much larger and much smaller, with the largest guns being capable of destroying medieval castle and city walls, and the smallest weapons eventually being handheld by a new breed of light infantryman, the medieval handgunner. Though poor construction and an elementary firing mechanism made early small arms an unreliable weapon system in the late medieval period, the light infantry handgunner would increasingly play a role on the battlefield next to archers and crossbowmen in the final wars of the period. As gun barrels became longer and the art and science of casting iron improved, specialized siege artillery called bombards began to have a devastating effect on medieval fortifications. These early cannon were expensive to build and operate, and difficult to transport, and to be effective they needed to be just yards away from the target wall. Once in place, bombards fired stone shot weighing as much as 900 pounds, breaching walls and reducing towers almost at will. In 1409 the duke of Burgundy purchased two bombards that could hurl stones weighing between 700 and 900 pounds. The ‘Dulle Griet’ or ‘Great Bombard of Ghent’ was a forged iron cannon over 16 feet long with a 25 inch calibre. It could fire a stone shot weighing more than 750 pounds. These cumbersome weapons could be aimed in one of five ways – by placing a fixed mount on terrain at the desired angle; by mounting the cannon on a fixed axle to provide its aim; by using the terrain and axle together to aim the weapon; by using a rock or wall to adjust the aiming angle; and finally, by adding a calibrated aiming mechanism to the mount to change the angle of attack. But changes in the fifteenth century improved the range and impact power of siege artillery. In the early 1400s a process called ‘corning’ began to be used when making gunpowder, mixing brandy, vinegar or even human urine into the black powder to form it into tiny pellets. Air flowed between the pellets allowing the powder to burn much faster and more evenly, greatly increasing the power of gunpowder weapons. By 1450 siege artillery further improved when stone shot was replaced by cast-iron balls, which had less ‘windage’ (space between projectile and the interior of the bore) and therefore attained greater muzzle velocity and impact energy. During this time, cannon were made in all different bore sizes, with little or no standardization until the late fifteenth century. Initially, gunpowder weapons had more of an impact on sieges than they did on the battlefield. But with the adoption of smaller field artillery in the fifteenth century, medieval commanders had at their disposal another kind of missile platform to menace enemy formations. These guns began to appear more frequently on the battlefield, including many battles under survey here: at Agincourt in 1415, at Grandson and Murten in 1476, and at Nancy in 1477. But medieval field artillery still suffered from being too large and unwieldy to move easily on the battlefield, and therefore often became ineffective after the initial stages of the battle. True field artillery did not make its sudden and dramatic appearance until the final decade of the fifteenth century, when the French invaded Italy. Here, these new guns, mounting new and lighter cast- bronze cannon on two-wheeled carriages pulled by horses, gave the French unprecedented tactical mobility against enemy formations and entrenched artillery positions. But France’s artillery supremacy on the battlefield was soon reversed by dramatic Spanish improvements in infantry small arms and tactics. As a result, field artillery declined in importance in the sixteenth century, except in the attack and defence of fortifications and in naval warfare. To assist in the transition from a medieval to a modern army, Duke Charles published three detailed military instructions or ordinances every year from 1471 to 1473, standardizing the use of uniforms, armour and weapons for each man, and grouping them under conductors in companies with a designated hierarchy of numbered banners. By 1473 these Compagnies d’ordonnance numbered 900 men, based on a nine-man lance of heavy cavalry made up into four squadrons, with each squadron supported by 25 men-at-arms, 25 light horse, 25 valets and 75 mounted light infantry archers, further supported by contingents of 25 crossbowmen, 25 pikemen and 25 handgunners, all on foot. Unable to achieve these numbers with recruitment, Charles continued to employ foreign mercenaries. After conquering Lorraine, Duke Charles marched into Alsace and took the surrender of the city of Grandson in February 1476. His execution of the garrison there solidified Swiss opposition, and on 2 March a relief army of 10,000 men arrived to block the Burgundian invasion. Recognizing he outnumbered the Swiss army three to one, Charles planned a defensive engagement, one that would capitalize on the confederation’s aggressive way of fighting. After launching two heavy cavalry charges into the unyielding Swiss ranks, the duke prepared for the inevitable, a Swiss heavy infantry counter-attack into his own centre. Employing a tactic similar to those used at Marathon and Cannae, Charles ordered his centre to pull back in the hopes of crushing the advancing Swiss squares in a double envelopment. But despite superior numbers, the Burgundian duke’s men lost their nerve and the planned retreat of the centre became a rout. Pressing forward with murderous efficiency, the Swiss mowed down the rear of the fleeing army, killing 300 invaders, and captured the Burgundian camp and over 400 artillery pieces. Swiss casualties were 200 men. Despite the rout at Grandson, Charles quickly re-formed his army and resumed his invasion of confederate territory. It took several months to piece together his artillery train, but with this completed, Charles moved his army and on 9 June laid siege to the walled city of Murten, recently reinforced by a garrison of 500 Bernese men and, ironically, the majority of the captured Burgundian artillery. Over the next week, the captured artillery had a devastating effect on the Burgundian assaults, but on 17 June, Charles ordered his heavy bombards to be brought forward, and the besiegers successfully breached the southern walls. But even an eight-hour infantry assault against the damaged walls could not overwhelm the Swiss defenders, and on 19 June, Charles halted the attacks and turned his attention to the east, where a large Swiss army was expected to emerge in relief of Murten. Charles the Bold ordered his troops to prepare for the defensive, and construct a ditch and palisade entrenchment known as the Grünhag, manned by light infantry and artillery. He intended to use his bowmen, handgunners and field artillery to create a killing field, then exploit the chaos with his flanking cavalry. But 21 June passed without the arrival of the Swiss, forcing Charles to stand down his army. Finally, on 22 June, a large Swiss relief force of 25,000 men exploded out of the woods and into the undermanned Burgundian defences. At the time of the Swiss arrival, only 2,000 light infantry manned the Burgundian centre, with 1,200 heavy cavalry in support. The rest of the duke of Burgundy’s troops were eating in the camp some distance away. Advancing from the north-east through the Birchenwald forest, the Swiss army was concealed until it was only a mile away from the Burgundian lines. The Swiss attacked from a column of three battle squares, supported by a vanguard of 5,000 light infantry skirmishers, protected by a contingent of 1,200 heavy cavalry on the left. Behind the van, 12,000 Swiss heavy infantry made up the centre square, followed by another 7,000 heavy infantry in the rear. The three Swiss squares marched in echelon, with the centre and rear squares set back and to the left of the vanguard. Behind the Grünhag, the Burgundian men-at-arms (including mercenary English longbowmen) were ready for the impending attack, and the first wave of the Swiss vanguard suffered heavy casualties from concentrated crossbow, longbow and light artillery fire. For a moment, the momentum of the initial Swiss assault was checked, but shrewd manoeuvring by part of the Swiss vanguard allowed the attackers to bypass the earthworks and turn the enemy’s flank. With the Grünhag in friendly hands, the centre and rear squares surged westwards to cut off any Burgundian retreat to the south. Meanwhile on the Swiss left flank, the 1,200 allied heavy cavalry scattered the Burgundian horse, then galloped on to attack the now fleeing Burgundian centre. There was no escape route for Charles’s new model army, and the Swiss, pledging no quarter, took no prisoners. A timely sortie by the Swiss garrison in Murten aggravated the Burgundian situation, striking the broken army in the rear. In the ensuing massacre, the duke lost 12,000 men, cut down or drowned in nearby Lake Murten. Swiss casualties were light, only 410 men. The Burgundians also lost their artillery park, with the Swiss profiting by the acquisition of another 200 guns. Charles the Bold’s third and final battle against the Swiss took place at Nancy in January 1477. Driven out of Switzerland in the autumn of 1476, the duke took up a strong defensive position behind a shallow stream south of the city of Nancy, the capital of Lorraine, once again blocking the likely angle of attack with his artillery. But his army was by now only around 12,000 men. The sudden appearance of the main Swiss force of 20,000 from the woods took the Burgundians by surprise, with the van circling to the left and attacking the Burgundian flank. In a co-ordinated strike, the Swiss fell on Charles’s troops, wielding their pikes and halberds. Attacked on two sides by overwhelming numbers, 7,000 Burgundians were killed, including Charles himself, his head split open by a halberd stroke. In less than a year, the Swiss defeated three Burgundian armies. The battle of Nancy ended the power of Burgundy forever, allowing Charles’s other nemesis, King Louis XI of France, to finally incorporate the duchy and its innovative military institutions into his kingdom. Despite a relatively balanced combined-arms tactical system, the Burgundian duke’s new model army was unable to ‘match the discipline of the Swiss or cope with the élan of their assaults’. Charles’s failure stemmed from taking on the best heavy infantry in Europe. Swiss militia armies were large and quickly mustered, but they could not stay in the field for long. Charles’s aggressive strategy of seeking battle brought his armies into conflict with a motivated enemy fighting to protect its homeland. Nevertheless, his combination of horse, foot and artillery was to become a model for European armies for centuries to come. After the death of Charles the Bold at Nancy in 1477, the Swiss acquired a reputation for invincibility that lasted until the battle of Marignano in 1515. They created a heavy infantry weapon system that could do more than passively resist cavalry charges or engage in sieges. Disciplined and relatively well articulated, the Swiss battle square was capable of offensive manoeuvre and all-round defence. 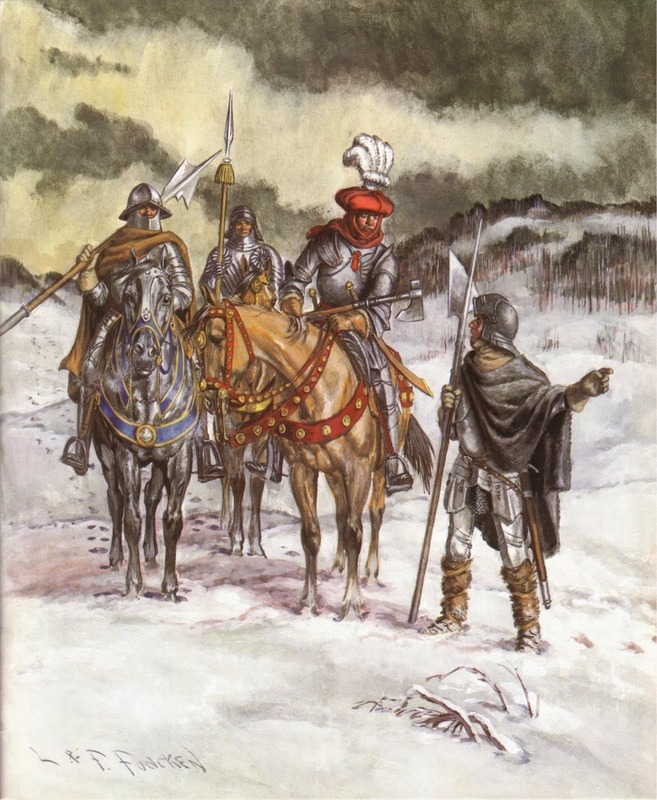 And like English light infantry longbowmen, Swiss heavy infantry found themselves a wanted commodity on the battlefields of Europe, with Swiss mercenaries soon employed as mercenaries in armies all over the continent. Impressed with the success of the Swiss battle square in the wars against Burgundy, Louis XI added 6,000 Swiss mercenaries armed with halberd and pike to his own army in 1479, and in 1497 a cadre of 100 Swiss elite were officially organized as the French king’s personal bodyguard, the Garde des Cent Suisses. In Italy the Swiss hired themselves out to Italian mercenary commanders or condottieri (from the Italian term condotta, the contract negotiated between Italian city-states and military entrepreneurs). Moreover, this innovation in heavy infantry bred imitation, and other nations developed their own pikemen modelled on the Swiss. The Germans had the most success with their Landsknechts, who also fought abroad as mercenaries. By the close of the medieval period, the Swiss method of fighting would be diffused to all of western Europe. Niccolò Machiavelli (1469–1527), writing in the early 1520s, found that all infantry imitated the Swiss. By the middle of the sixteenth century, French, Spanish, German and Italian armies used what has been described as the Swiss way of warfare, even if they adopted the Swiss phalanx in modified form. Pikemen, increasingly supported by light infantry handgunners, remained a persistent tactical entity on European battlefields well into the early modern period.